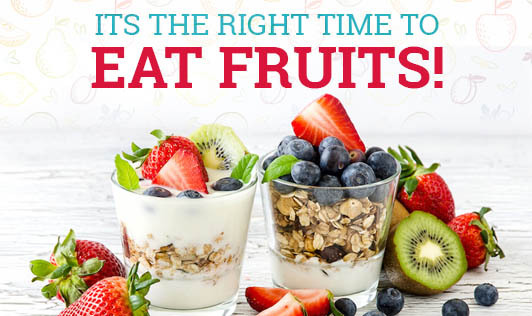 Its The Right Time To Eat Fruits! Fruits are rich in fiber, vitamins and micronutrients. But most of us are not aware of what is right or wrong, and whether to eat fruits before a meal or after a meal! It is beneficial to eat fruits regularly as it is loaded with nutrients like vitamins, minerals, fiber and very importantly, antioxidants which play a major role in maintaining optimum health. Fruits detoxify the system and it can also be included in most of the desserts as a natural sweetener. Including three servings of fruits daily, cleanses toxins from the body and also promotes better functioning of the digestive system. So what is the ideal time to eat fruits? People keen on losing weight, eat fruits before a meal as it keeps you feeling full. Its high fiber content facilitates maximum absorption of nutrients present in the fruit. People with gastrointestinal disorders like gastritis or ulcers should eat fruits after your food to avoid any kind of acidity. Here are a few instructions to guide you through the right way to eat fruits to reap maximum benefits. • After you eat a fruit, give a gap of thirty minutes and then eat the other foods. • If you have the habit of eating fruits after food, then give a gap of three hours to ensure that food you've had is digested and the maximum benefits of fruits are reaped. • Fruit eaten as sweet or a dessert will not give you its best result for the body. • Wash fruits properly before use and store them in appropriate conditions. • Avoid any kind of processed fruits as they contain a lot of sugar and preservatives in them and they would have lost their nutritional content as well. So, a fresh fruit is always a better and a healthier choice to make over a processed fruit product. Now that you have your facts right, what about a fruit - break? ?